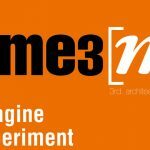 Erstmalig präsentiert auf eme3, festival internacional de arquitectura, Barcelona, Spanien. The presented project draws on habit, format, literature and space in order to construct an experimental representational system engaging with space and experience. It is one out of an ongoing series of Conversation Pieces, questioning and re-contextualising structural elements in architectural design. Photography and text are utilised to provide descriptive accounts of actions through space and time, exposing the tenuous boundaries between somebody’s life and the lived through environment. Devised through a series of dialogues the study explores the material and contextual structure of issues of rubbish and architecture. – The aim is to create a new imaginary scene, transforming an ordinary urban space into a sensory narrative environment, and as such conveying the [e]motions of the human subjects of the place.